Mansfield, a rural township and former shire, is 130 km north-east of Melbourne. It is at the end of the Maroondah Highway, between Lake Eildon and Mount Buller. During the 1840s settlers occupied land west of Mansfield and by the end of the decade occupation had spread eastwards. In 1850 a station holder, Alfred Chenery, built a blacksmith’s forge near the intersecting boundaries of four pastoral stations at Fords Creek. It became a convenient stopping place, and the following year land was set aside there for a surveyed township. It was first named after Mount Battery, about 4 km to the east. The name proved to be unpopular and it was replaced by Mansfield in 1856, at the prompting of a local station manager who apparently had fond memories of Mansfield, near Sherwood Forest, Nottinghamshire. By 1856 gold had been discovered at the Jamieson River south of Mansfield, and in 1861 it was discovered at Woods Point. The most suitable route for transporting mining machinery was through Mansfield. Small amounts of gold were also discovered around Mansfield. A school was opened in 1858 by the Anglicans and Free Presbyterians, who built churches in 1865 and 1866 respectively. The Mansfield district was proclaimed a shire on 31 December 1866, by when the township also had two hotels, a court house, a steam flour mill and a hospital. In addition to sheep grazing, Mansfield had dairying (butter factory opened in 1893) and cultivation for oats, potatoes and fruit. About 25 km north of Mansfield, near Tolmie, a party of Mansfield police were searching for the Kelly gang in October 1878. When two of them camped at Stringybark Creek they were bailed up by the outlaws. One of the police made a break for freedom and was killed. Two other police who returned to the camp were also killed. A monument to the three police was installed the following year at the intersection of Mansfield’s two main streets. The monument stands at the front of a wide central plantation which runs down the main commercial street. Until 1919 the Mansfield shire was confined to the northern pastoral regions. The mining towns along the Jamieson to Woods Point road were in the Howqua shire, and Woods Point had been a borough between 1865 and 1894. In 1919 part of the Howqua shire was added to Mansfield shire, increasing its area by half. As well as adding mining areas to the shire, Howqua had large forest areas. 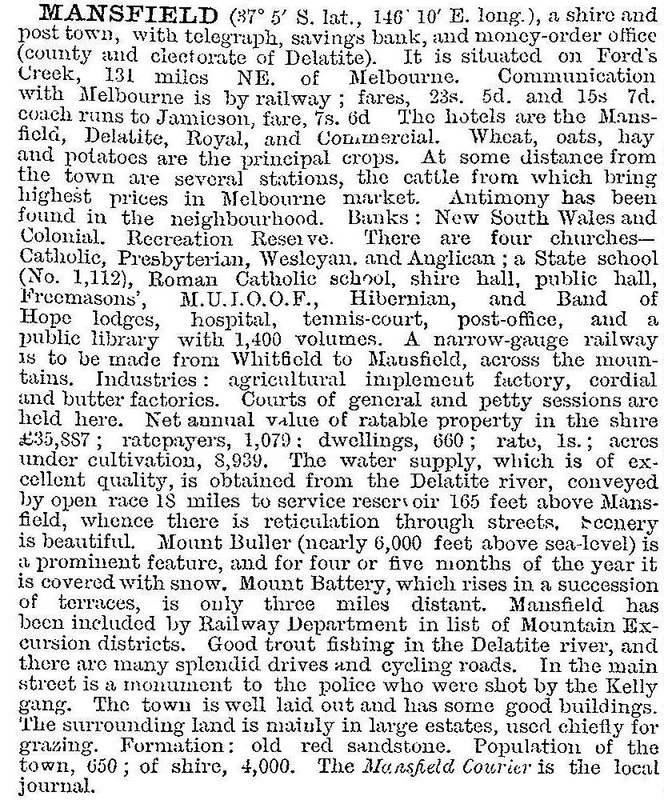 About 50 km east of Mansfield is Mount Buller, and during the 1920s the Ski Club and local interests began to open it up as a tourist resort. The postwar development of the Mount Buller snow resort has added substantially to Mansfield as a tourist destination or as a stopover. Westwards, the development of Lake Eildon as a boating and recreation site has also brought tourists to Mansfield. In 1964 the State tourism authority began promoting Mansfield as the Gateway to Leisureland. Mansfield has also benefitted from horse-riding holidays in the hills to the east. ‘The Man from Snowy River’ was filmed east of Mount Buller in 1982. The main shopping street has been enlarged by several new groups of shops. The railway station has been converted to a tourism and information centre. Mansfield has State primary and secondary schools and a Catholic (1876) primary school. The court house (1879), the former police stables (1886), the police memorial and the railway station are on the Victorian Heritage Register. The main Street, Highett Street, is named after William Highett, who was a squatter on the Maindample pastoral run. He came from Tasmania with his brother John, who grazed stock near the Dandenong Creek and named the Melbourne suburb of Highett. John Highett later settled at Geelong and named his property Highton, now a Geelong suburb, after his family’s farm at Weymouth, England. His son, Francis, built Highton Manor at Mansfield in 1896, which has been converted to a motel and restaurant. Mansfield has an active High Street shopping area, a hospital, a tourist information centre, golf, horse-racing, bowling and annual show venues, Anglican, Catholic and Uniting churches and a caravan park. Out of town there are rural campuses of several private schools, and in the town there are a Catholic primary school and a Steiner P-8 school (1985). In 2014 the State primary school had 286 pupils and the secondary college 420 pupils. Mansfield shire’s southern boundary is at Matlock, situated on a ridge where rivers drain south to Gippsland and where the Goulburn River’s headwaters begin a northward journey to the Murray. It is joined by the Jamieson, Howqua and Delatite Rivers, descending from timbered slopes and converging at Lake Eildon and undulating farmlands. The Maroondah Highway is the main point of entry, which was paralleled by a railway from Tallarook to Mansfield (1891-1978). The highway passes through Mansfield to Mount Buller. North of Mansfield the landscape approaches the northern plains. In 1994 there were 33,000 meat cattle, 123,000 sheep and 16,300 lambs grazed in Mansfield shire. Sown pasture totalled 40,000 ha, about half of the shire’s area under farm production. On 18 November 1994, Mansfield shire (3919 sq km) was united with Benalla shire, Benalla city and part of Violet Town shire to form Delatite shire. Eight years later Delatite shire was divided into two (‘demerged’) and a new shire of Mansfield (3892 sq km) emerged. The increase in population in the former shire indicated the trend to rural/residential living in districts outside the township, and allotments were taken up within the town throughout that time and up to the present.